It's the Etude House Proof 10 Eye Primer. I got this product seven months ago (see, I told you I've had this for many months already) and it was actually really hard to find that time because it was always out of stock. That's the problem with well-raved products... always out of stock. Anyway, now I'm seeing more of this in Etude House boutiques so you won't have any problems in purchasing it anymore. What is an eye primer, anyway? Well, when I was just starting out I asked myself the same question. And so I Googled. I found out that eye primers can make your eyeshadow appear more vibrant by acting like a base, and that it can make your eye makeup last longer on your lids by preventing it from creasing and smudging. If you watch a lot of beauty gurus on YouTube, then you would notice that applying eye primer is a staple to their routines. The all too famous primers are the Urban Decay Primer Potion (UDPP) and Too Faced Shadow Insurance (TFSI). This is the first legit eye primer that I have used. Before this, I just used concealer as primer and it was just ok since I wasn't really putting on a lot of eye makeup back then. Right now, however, I almost always use eyeshadow and eyeliner so an eye primer is a must. What makes it even more important is the fact that I have monolids. Monolids are really prone to eyeliner smudging and e/s creasing. Description (from Etude House): Proof 10 Eye Primer supplies coverage to eyelids and around the eyes to enhance eye shadow color and integrity for a longer lasting, perfect 10 look. Directions: Use fingers to gently apply primer to upper and lower eyelids prior to eyeshadow application. Also applicable to eyelines prior to eyeliner application. So first I'm gonna talk about the packaging. It comes in a 10-g bottle with a looooong cap. Since the bottle is clear, it's easy to see how much product is left inside. The applicator is a short doe-foot one. I find that it's a bit hard to scrape off any product from the sides of the bottle with an applicator like this. Some may find doe-foot applicators like this to be unhygienic for use and may prefer a squeeze-type packaging like that of the TFSI. I like the consistency of the product itself. It's easy to blend and it dries quickly but not too quickly. 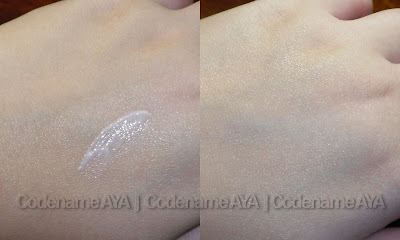 It also only comes in one shade, as most primers do, and it dries clear. I like that this primer really makes my eyeshadow more vibrant. See? 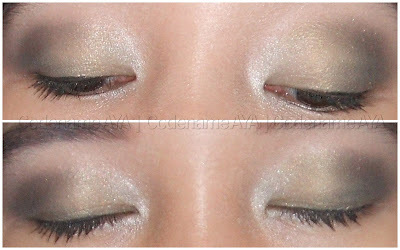 I used a not-so-pigmented eyeshadow from my Ever Bilena palette. I swiped the eyeshadow twice for each swatch. I also like that this primer really helps my eyeshadow and eyeliner stay on longer. Here are some pictures so you can see how effective this primer is on my lids. Note that my lids tend to get a little bit oily after a few hours AND that I have monolids. I went to the mall and didn't take my makeup off immediately after arriving back home. Seven hours after application, my eyeshadow still looked decent. There were minimal creases near the upper lashlines (thank the monolids for that) but the eyeshadow itself still looked ok. Here's another one. Back story: I went to church, went back home, fell asleep without removing my makeup (which is not good, I know! 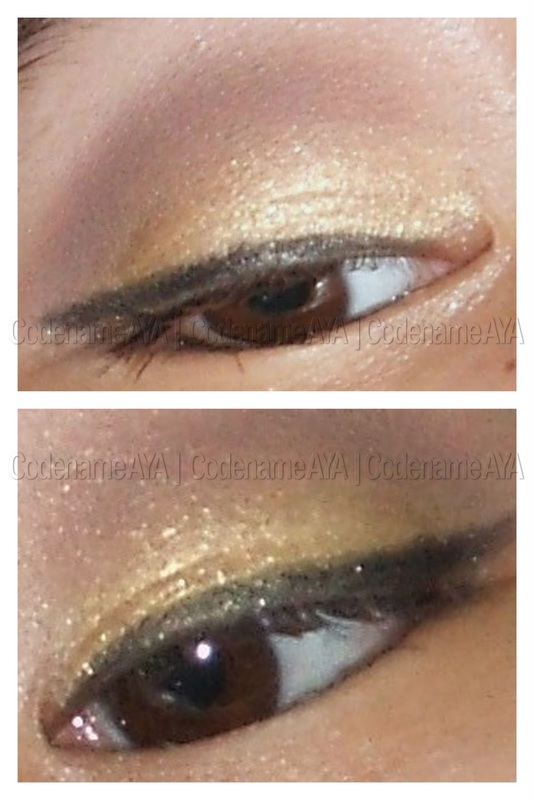 ), woke up, looked in the mirror and was surprised to see that my eye make-up was still there. It's not as neat as it was 9 hours ago but it still did look pretty decent. Minimal smudging and creasing. My e/s after 9 hours. Both pics are "after" pics. If I weren't wearing an eye primer, the liner would have smudged all over my lids after just an hour or two. Affordable at P298 for 10g of product - I've been using it for many months now and I still have a lot of product left. I've always wanted to have this, but I still have a couple of primers to finish. awesome review sis. sounds like a really nice product! Other than the bottle issue, this sounds awesome! I wanna try this but I haven't bought it. Thanks for the great review. did the eye primer provide coverage too just like concealer? i am also using this eye primer and i love it! though, do you have any tips on how i can scrape the remainig product?